The railway first opened in 1979, as a 7 ¼ inch gauge railway. The line was regauged to its present form in 1994. Trains depart from Howard’s Halt, where there is a ticket office, and run round the west loop anticlockwise, then run round the east loop clockwise. There is one locomotive 'Elli Che' an American Amtrak F40PH outline. Opening Times: Daily from 11th February to November 4th 2012, normally from 10:15am to 3:30pm off-peak and from 10:15am to 5:30pm in the summer and on school holidays. 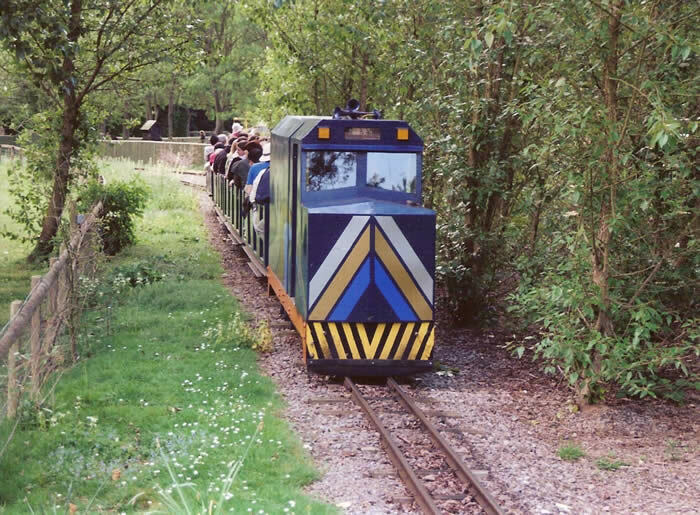 Fares: Park Entry Fee: Adults £9.50, Children £7.50 (Summer) and Adults £6.50, Children £4.50 (Other) Train: One free ride per ticket, £1 for additional rides. BPR Page was last updated on the 3rd April 2013 with photo and fares updated.